Before he hit the big time with The Mummy (1999) reboot, director Stephen Sommers cranked out a nifty little B-monster movie called Deep Rising (1998). It had nothing more on its mind than to deliver an entertaining thrill ride and for the most part achieves this goal. John Finnegan (Williams) is a mercenary boat captain transporting a crew of amoral soldiers-of-fortune bound for a luxury ocean liner during a dark and stormy night. These crude crooks are comprised of a bevy of B-movie character actors, including Wes Studi (The Last of the Mohicans), Jason Flemyng (Lock, Stock and Two Smoking Barrels), and Djimon Hounson (Gladiator). They arrive at the cruise ship and find it devoid of its wealthy passengers. Finnegan and the crooks find signs of an epic struggle. As they progress through the ship, something very large and very deadly begins picking them off and it’s up to our hero to get them out of there. 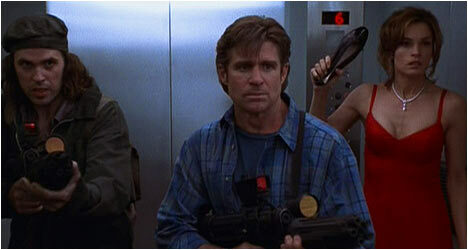 Deep Rising is the kind of B-monster movie that has become a staple of the SyFy Channel. It plugs in all the usual elements: a square-jawed hero (Treat Williams), a wise-cracking sidekick (Kevin J. O’Connor), the beautiful woman (Famke Janssen), and, of course, the big nasty creature. The film was originally conceived as much a higher concept with a bigger budget and big-name movie stars like Harrison Ford, but once he dropped out it was downgraded drastically with Treat Williams headlining instead. The Puppet Masters (1994) is based on Robert A. Heinlein’s classic 1951 science fiction novel of the same name. In the grand tradition of Invasion of the Body Snatchers (1956), the film depicts an invasion by aliens from outer space that begins in a small town in Iowa, the heart of America. Andrew Nivens (Sutherland) leads a small team of federal agents in the investigation and discovers odd little things, like the lack of birds or the brazen way the townspeople display the alien craft as if it was just another tourist attraction. The behavior of the townsfolk is definitely a little off to say the least. It doesn’t take long for Nivens and his team to figure out what’s going on: alien parasites have attached themselves to human hosts and are controlling them like puppets. Eric Thal and Julie Warner play the obvious Mulder and Scully surrogates only they are both savvy believers. The Puppet Masters is a surprisingly engaging sci-fi thriller that wastes little time establishing the alien threat and opts to dive right in, immersing our heroes in the ever-increasing struggle against the aliens. The film is well-paced with exciting action sequences punctuating the story at key moments.